A group of four Iraq War veterans are framed and wrongfully prisoned. Looking to clear their names, one by one each member of the group is broken out of prison in order to devise a plan, reclaim their military status and prove their innocence. Hollywood is constantly searching for older franchises or properties that fans love and are willing to re-visit. I grew up on The A-Team television series and loved it. 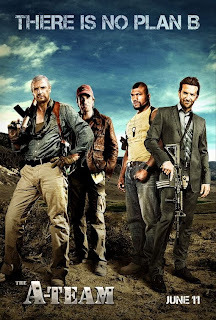 Thankfully I can say the say about the Joe Carnahan directed feature film. "The A-Team" is a blast and everything I expected from an summer action film. It is filled with enjoyable performances. It has wall to wall explosive action and jammed with hilarious moments. As Jessica Biel's character Charisa Sosa says in the action, "These guys specialize in the ridiculousness," and boy does this movie do exactly that. The action is entirely silly. Right off the bat the film sets up the characters and its agenda as being a good time. Certainly some of the major plot points are not easy-going, however the story and how it unfolds are very much tongue and cheek. Much of this probably stems from the original series, which was of lighter fare. The show always revolved around serious concepts but kept them light hearted with a solid mix of comedy, action and drama. Carnahan's re-tooling does the same thing and does it very well. In every way "The A-Team" is an origin movie. The flick delves into the backstory of the team for hire we all knew and loved from the 1980's television series. The difference is, it updates their story to the Iraq War rather than the Vietnam War. The television series never really explored how the A-Team became mercenaries other than the brief introduction before every show. Well, this movie does exactly, that and does a bodacious job of it. The storyline feels legitimate enough and the performances are spot on. The entire group of actors selected did a surprisingly impressive job of embodying the original feel to the A-Team. Going in I expected to like Liam Neeson and Sharlto Copley but was very reserved I'd feel the same about Quinton 'Rampage' Jackson and Bradley Cooper. Luckily they all worked for me. Sharlto Copley actually steals nearly every scene he is in as Murdock. That doesn't mean the other performances aren't noteworthy, because they are. Liam Neeson is exactly what I expected, he leads the group with ease. Bradley Cooper is generally a douche in his performances and his role here as Face is suppose to be just that. Cooper doesn't go overboard with the performance, but instead ham's it up just enough to keep you laughing and not hating him. The one role every A-Team fan worries about is B.A. Baracus. There's no replacing Mr.T and this movie never intends to. Quinton Jackson is very much his own Baracus. There are still some of the same things we loved about the original B.A., but overall the changes worked without sullying the original character. Jackson actually does a bang up job of bringing his own flare and humor to the role. I especially loved the exchanges between Baracus and Murdock. Copley and Jackson really did have a good chemistry going on. Speaking of chemistry, the entire A-Team gelled real well. It was apparent these actors had a good time filming the movie which across time and time again on screen. As for the action and pacing of "The A-Team," the summer movie packs in a wallop of thrills. The action never really slows down for the entire movie. With gunfire, explosions and exhilarating scenarios unfolding quite frequently. I really enjoyed the editing to all the planning montages. Nearly every mission the A-Team endures throughout the movie, we see a back and forth editing done from planning to execution. A technique that was used effectively in the Ocean's trilogy and made for enjoyable ride here, allowing for the action to not seem to over bearing. The action sequences are also filled with side splitting banter amongst the members of the A-Team and also between the forces opposing them. Overall I throughly enjoyed "The A-Team." The action comedy never took itself too seriously and the result is a thrill ride that is fun for the whole family. I took my 3 boys along with my wife and we all came out smiling, not to mention humming the original theme. Which I must say, was worked in flawlessly. Fans of the original series will also be excited to know that you do get the original intro to the television series at some point in the film and it actually worked perfectly.